Last week we announced the two Archives.com grant winners for January 2011. 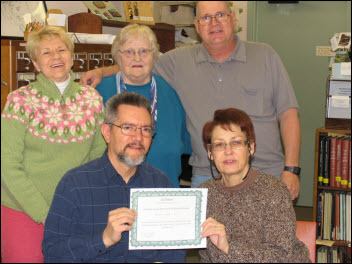 One of those recipients was the Columbia County Historical & Genealogical Society (CCHGS), and here we will provide a more detailed introduction to their project and how they plan to use the Archives.com grant funds. Several members of the CCHGS standing committee holding the grant certificate. Back row: Nina Feltser, Donna Laubach, Cary Rhodomoyer; Front row: Andre Dominguez, Malinda Price. A Columbia County marriage license docket and copy of computer index page. CCHGS background: the Columbia County Historical Society was established in 1914, and merged with the Central Susquehanna Valley Genealogical Society in 1999. These two organizations now make up the Columbia County Historical & Genealogical Society, located in Bloomsburg, Pennsylvania, which is dedicated to the collection and preservation of Columbia County history. The organization is run exclusively by volunteers, who help to index historical documents like church records, cemetery listings, genealogies, etc. About the project: CCHGS applied for the Archives.com grant to transcribe marriage license dockets in their possession, years 1921 to 1939. These dockets contain an estimated nine thousand bride and groom names, which CCHGS plans to make available both in electronic and book form. The Archives.com grant funds help CCHGS to pay for the records transcription, printing, and book binding. Vice-President Andrew Dominguez notes: "Instantly researchers will be able to determine if marriage license information about their Columbia County ancestor exists at the Courthouse. This information will be located where it is most likely to be used. Local researchers will find the marriage license books, with the names in alphabetical order, at the Columbia County Courthouse and the library of the Columbia County Historical & Genealogical Society (CCHGS). And researchers from anywhere around the world will be able to search the CCHGS Website "Marriages" database for their Columbia County ancestors." Archives is so happy to assist CCHGS to complete their project, which will enable researchers around the world to learn more about their Pennsylvania heritage. Congratulations to the Columbia County Historical & Genealogical Society!